/ Modified aug 29, 2018 6:11 p.m.
Pima County Democrats primary watch party, Aug. 28, 2018. The primary election is over and the winners now head for the November election. The Pima County Democratic Party has a message to the candidates who didn't win. "We need to work together, damnit," Pima County Democratic Chair Jo Holt said to candidates and party supporters at their Tuesday night primary party. After her speech she explained why, on a night meant to celebrate victories, she was so passionate about something not everyone wants to talk about publicly. "There's a frustration that is being built, that's building amongst the Democrats in Pima County — a frustration of not being able to get our very good candidates elected to statewide positions and then to have negativity build into what is an unusually active primary season for us. And I think it is that frustration but also the real strong feeling that when we work together that we are almost unstoppable," Holt said. Her message was not lost on those who didn't win their primaries. Gubernatorial candidates Steve Farley and Kelly Fryer stood on stage at the Tucson party arm in arm. "Thank you so much for what you have done for this state, and let's go out and change this thing together no matter who wins tonight," Farley said, addressing Fryer, who also expressed thanks. They both lost to David Garcia. At his Phoenix victory celebration, Garcia also brought up party unity. "I have not had a chance to check in with Steve and Kelly yet, but I want them to know how much I appreciate them. They are two committed Democrats who pushed important issues and they made me a better candidate and us a better campaign," Garcia said of his competitors. The three Democratic gubernatorial candidates appeared at a number of debates together during the campaign season. At one in Tucson in the early spring they pledged to support whoever won the nomination. Pima County Democratic Chair Holt says that pledge is sticking. "They are taking the unity thing very seriously. I know the [2nd Legislative District] House candidates take it very seriously. We have other areas in Pima County where it is more of a challenge for those individuals, and you know we focus on where it works, because what a great example they set," Holt said. She did not mention 2nd Congressional District candidate Matt Heinz by name, but in recent weeks he has been chastised by Democrats, including former district Congresswoman Gabby Giffords, for comparing Ann Kirkpatrick to a meth addict. 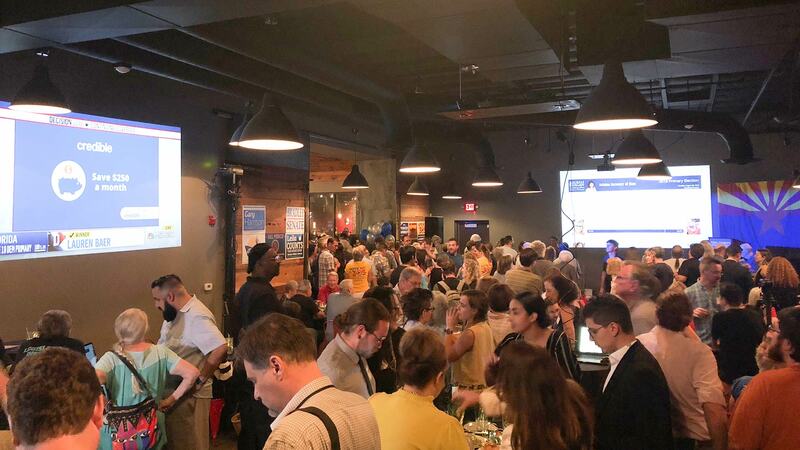 Heinz did not attend the Democratic Party event Tuesday night, and did not tell media organizations where he would be watching results on election night. 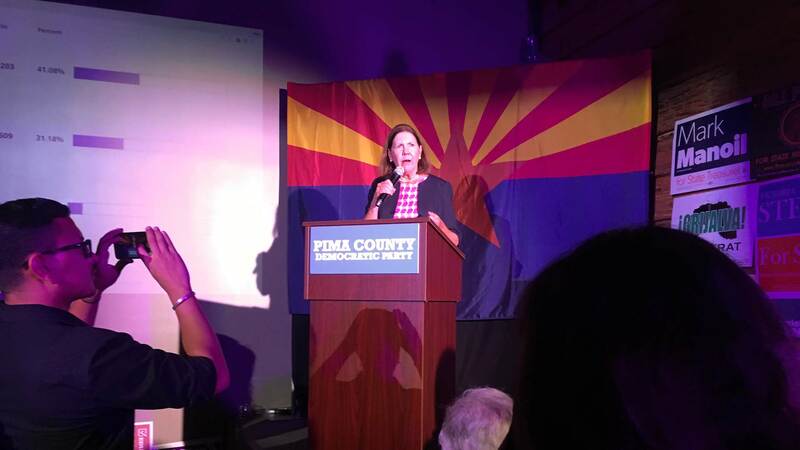 Ann Kirkpatrick speaks at the Democratic watch party during the Aug. 28 primaries. Holt said a lack of party unity will sink Democrats in November. "They tear each other down and they don't come out and vote, and those two things are connected to one another. ... I am definitely pretty charged up about that because this is too critical. This is not a normal election." The Democratic gubernatorial candidates also reached across the aisle on Tuesday night. Nominee Garcia offered words of praise for the late Sen. John McCain, and Farley says campaigning is on hold for two days, adding that he will attend services for McCain in Phoenix. After that, Democrats will work to figure out how to heal the wounds of primary before early voting for the general election begins in six weeks.